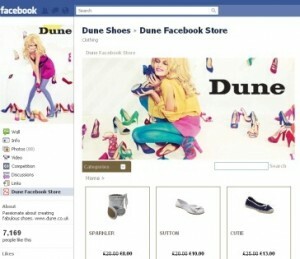 Sadly Dune’s store, developed by Zibaba.com, isn’t currently transactional and Facebook fans can only browse products within the Facebook platform. The default display is by lowest priced, meaning unattractive sale items are the most prominent. The search function was, at the time of writing, broken and the poor colour scheme actually makes navigation invisible meaning users are unable to move past page one any given category. If a customer does wish to make a purchase they are directed back to the desktop site which makes for a long journey to checkout. Dune has been present on Facebook for some time and employs a full time social media manager. The company says that so far the conversion rate of clicks to purchases is over 4%. The store is being marketed to users via Facebook ads which are heavily targeted and easy to track and measure. If the company sees a strong return on the investment they will look at developing a transactional page.